We carry the entire range of Supreme pool tables, as chosen by the World Championships, as well as the IPA and UK Pool Tours. Visit our showroom for a demonstration. Supreme Pool Tables have been manufactured in the UK for over 25 years, and Supreme take pride in supplying the pool industry with a wide selection of high quality slate bed pool tables. Supreme are a leading force within the industry in developing and engineering table improvements to enhance playing standards and table reliability. Their tables are the choice of major championship events, where professional players and organisations insist on the best, and are endorsed by the World 8-Ball Federation as well as the IPA (International Professional Pool Association). We stock the entire range of Supreme pool tables including the world-renowned Supreme Winner Pool table, the more traditionally styled Supreme Prince pool table, and the new modern Supreme Prince Slimline table. We have both the Winner and Prince on display in our showroom, so pop in and try out one of these amazing Supreme pool tables for yourself. Our Supreme pool tables all come complete with free delivery and free accessories, so you have all you need to get started once you receive your table. These accessories include two cues, a set of balls, a triangle and chalk, so with no extra cost you'll be enjoying a game of pool on a fantastic new table. Each one of Supreme's pool tables is made to extremely high standards, with expert craftsmen manufacturing each table and finishing them by hand. Our Supreme Winner pool tables come with over 30 different cloth colours and designs, and a whole host of standard and luxury cabinet finishes. It's easy to see why the Winner is one of our most consistently popular tables, with its classic look and flexibility, combined with an incredible price. All Supreme tables are fully customisable and come in a great range of finishes and cloth colours. If you can't find exactly the cloth colour you want in their standard range, we can supply Smart Cloth by Hainsworth or Elite Pro Cloth, or one of our huge range of logo cloths, which include football club logos, Jack Daniel's or any printing of your own design. If you need any help choosing your perfect table, or deciding on colour schemes and finishes, please give one of our expert advisors a call and we'll be happy to talk through all your options. 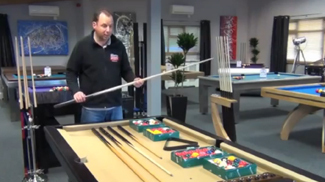 All our Supreme pool tables come with free delivery to most locations within mainland UK. However, for locations further north than Glasgow or in Cornwall there may be an additional charge depending upon your exact location. Please call our friendly customer service team on 0800 622 6464 for a quote. If you are looking for some expert advice, either on Supreme Pool Tables or on any of our other products, please just give our friendly team of advisors a call on either our freephone number 0800 622 6464, or on our main line number 01454 413636.